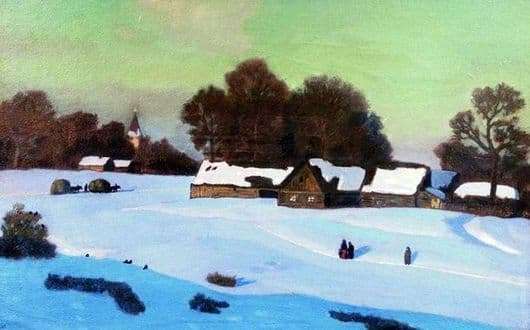 The painting depicts a small village in the winter. Fluffy snow occupies most of the picture, it covered the whole earth and even settled on the roofs of houses. The palette of snow-colored shades – rolling from dark blue to white – is very beautifully conveyed. It seems that nature fell asleep until spring, wrapped up in frost. Behind the village you can see a dense forest, with mighty tall trees, distinguished by a dark mass against a yellowish-green sky. Among the branches of trees, you can see the dome of the church. In the foreground of the picture you can see the river ice-bound. Along it are small shrubs, on which the birds are located. Perhaps they are in search of food, or weakened by the cold and rest. Behind the horizon is the sun, its last rays change the color range of snow. Evening comes down to the village. In the windows of wooden houses visible reflections of the setting sun, and maybe it already lights up. Paths to the village, which are visible from afar. According to their snow depth, it can be assumed that winter is coming. In the central part of the canvas are visible people with a small child. They are walking along a narrow, beaten path, perhaps rushing to get into the village before dark. Judging by the silhouettes, they are warmly dressed, and the snow squeaks under their feet. One woman stopped, perhaps, to admire the winter landscape. On the other hand, two sleighs, drawn by horses with large haystacks, are sent to the village. Cab drivers go near and drive horses. To one of the courtyards adjacent construction of the barn, probably, people carrying hay, are sent to him. Despite the image of winter, the picture conveys a sense of warmth, tranquility and warmth. The painting is well conveyed the beauty of Russian nature in the winter. Looking at the picture, you get a feeling of freshness from the frosty air.